Antoine Martinez was an expressionist painter of the mid 20th century (1913 - 1970). He produced more than 800 paintings and hundreds of drawings, in an unadorned, modern style. At the age of 15 he was enrolled in the Académie Julian, where he was a pupil of Paul Albert Laurens and then of Pougheon. 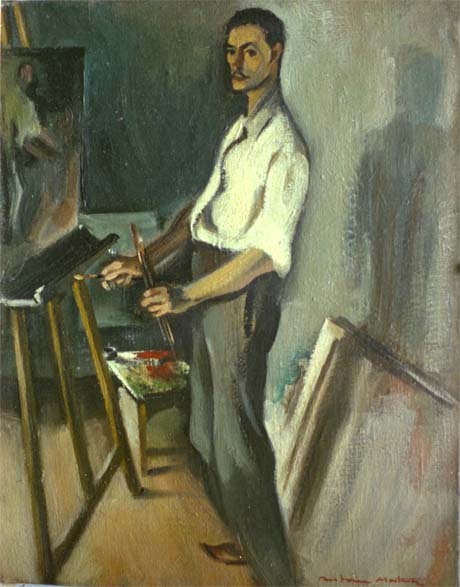 In 1932, when he was 19, he entered the Ecole des Beaux-Arts (School of Fine Arts) in Paris, in the studio of Devambez. He was several times a laureate in the Grand Prix de Rome contest, and won numerous awards. He was perpetually trying out different colours, lights and materials. Thus his painting evolved continuously throughout his life. He painted light but prefered to remain in the shade. The writer Emmanuel Roblès said that Antoine Martinez had the gift of isolation, away from trends. This explains how his work, which was monumental both in its power of expression and volume, remained virtually unknown for so long. To rediscover his work today is to realise how far his sensitive vision of the world remains contemporary. "All rights reserved. Except authorization, the reproduction and any use of the works which is not in order to individual and private consultation, is forbidden"